You have a lot to consider when shopping for a mortgage, and you don't want unfamiliar lingo bogging you down. Before you begin the process of buying a new home, get comfortable with these five key mortgage terms. Fixed-rate mortgage: With a fixed-rate mortgage, your interest rate stays the same for the entire loan, which means your monthly payments do too. 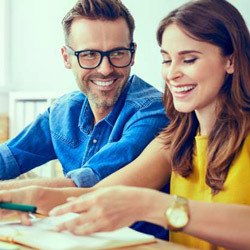 That predictability can help with budget planning, but fixed-rate loans sometimes come with a higher interest rate than other loans. Adjustable-rate mortgage (ARM): Your payments on an ARM stay the same for a set period but then change annually according to federal interest rates. While unpredictable on the back end, the initial rate is often lower than a fixed-rate loan. Closing costs: At your closing, you'll be required to pay for various services associated with your purchase, like paperwork processing and credit reports. To avoid any surprises, carefully review the loan estimate form you receive from your lender. This document, which is sent to most borrowers within three business days of receiving an application, outlines your estimated closing costs. Escrow: When making an offer on a house, a homebuyer submits earnest money that goes into escrow, an account held by a neutral third party. Those funds are then disbursed once the deal is finalized. You may also pay into escrow if your lender requires you to pay a portion of your real estate taxes each month. That money is then used to cover the bill when it's due. Private mortgage insurance (PMI): If your down payment is less than 20 percent of the full cost, your lender may require private mortgage insurance. You typically pay PMI along with your mortgage, though it drops off once your loan balance reaches a certain marker (usually 80 percent of the original loan). Learning these and other relevant terms can help expedite the process of getting a mortgage, leaving you to focus on finding the perfect home.